Amazon and Google, two of the world’s top ten biggest listed companies, jumped around 4% in the aftermarket on the back of above-market quarterly revenue numbers released overnight; they showed organic growth of 23% and 22% respectively. These numbers are significant, but it’s important to contextualise them with reference to the broader market. This top 10 list has evolved over the last decade and its intriguing to note that only two of the top ten biggest companies from 2007 made it to the updated list. 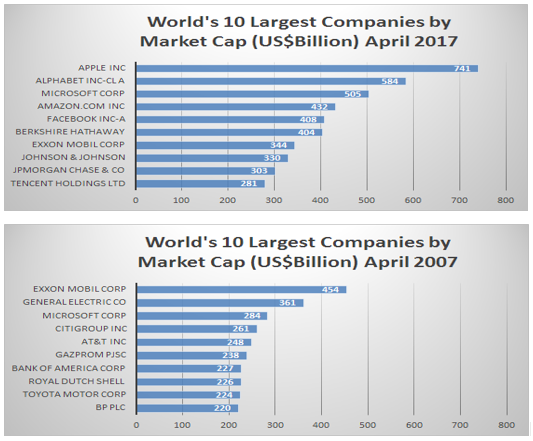 The combined market capitalisation of the world’s ten biggest companies back then stood at US$2.7 trillion, it now stands at US$ 4.3 trillion. Another of the top ten, Tencent, a Chinese social media company, had revenue growth of more than 40% in the most recent quarter - on 5 April it surpassed the market capitalisation of Wells Fargo to make it into the list at number ten. The ten-year annualised revenue growth rates for Tencent, Amazon and Google stand at 49%, 29% and 24% respectively. If an investor had invested in a market capitalisation-weighted portfolio of the world’s 10 largest companies in 2007 and held that position for the entire decade the cumulative return would have been -16%. This compares to a cumulative return of +17% had the investment been in the MSCI World Index. For anyone fortunate enough to have invested for a decade in the current 10 biggest companies, the return would have been +168%, assuming Facebook was added on its IPO in 2012. Clearly, there has been significant value creation in these companies. What will this list look like in 10 years from now? Should we expect the list composition to change as dramatically? Do the present constituents give us some data points? These are the questions that all investors should be asking today. Our mantra has been to seek future leaders by identifying dominant themes and the winners and losers that result as these themes play out. We are looking for the top 10 companies of the coming decade. One powerful concept shaping many companies’ success over the next decade is “knowledge in the network”. This already fuels the top line growth in 6 of the world’s current 10 largest companies, but will also disrupt the businesses of many companies which currently consider themselves not subject to the thematic. A network is simply a group or system of interconnected people or things. Knowledge in a network is the ability to understand and anticipate the requirements of the people or things in that network and facilitate the fulfilment of those requirements efficiently. Networks and data about user requirements have existed for some time, in the form of phone networks, online news networks, taxis etc. What has changed in the recent years is the scale and leverage which aggregation and analysis of all these previously unconnected, regional and independent networks have brought. This is possible because the data have been digitised. Present day network providers, unlike their predecessors, are multifunctional, ubiquitous and mostly global. To get a better understanding let’s look at Tencent. It has two popular social media products - QQ messenger, which is similar to MSN messenger and Wechat (Weixin in China) which is an evolved version of Facebook’s WhatsApp. Weixin started as a mobile operating system-agnostic messaging service (as is Facebook’s WhatsApp) and has 800 million plus subscribers, most of them in China. Tencent captures subscribers online time by enabling their interactions. Once subscribers are engaged and committed, Tencent is able to monetise the engagement in various forms, such as providing digital wallet functionality through Weixin Pay and the QQ wallet. The graphic below gives a glimpse of what the truly multifunctional, scaled up and flourishing network of Tencent looks like. A Weixin pay/QQ wallet account-holder, while keeping in touch with loved ones, is also able to hail a cab or a bike, buy goods and services (again because the data are now digitised) transfer cash to friends, invest in money-market funds, participate in games, watch shows, subscribe to music - the list goes on. Recently, Tencent bought a 5% stake in Tesla. It would make perfect sense for it to integrate this investment using the knowledge in its network (remembering that the Chinese government itself wants cars to go electric to help reduce pollution, and that Tencent has an investment in the dominant ride-sharing app Didi). Participating in the auto industry in China is a big opportunity, it alone could dwarf all of Tencent’s present revenue streams. Tencent is just one example. Companies like Facebook, Amazon, Alibaba, Google, Baidu, Microsoft and maybe Apple to a lesser extent, all benefit from the power of the knowledge in the network, and the business adjacencies that it creates. Its adjacencies for Amazon as well. Growth in prime membership numbers (to 80m from 58m a year ago) is leveraging these customers into new services - music, TV, publication subscriptions etc., to name a few. Cloud is annualising more than $14b in sales, and was virtually invisible as a business five years ago. These networks are live, flourishing and expanding in ways/industries no one could have anticipated.